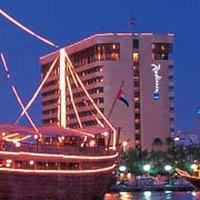 The Radisson Hotel is perfectly located for both business and leisure guests to Dubai. The 287 guestrooms at this 5-star hotel provide all the essential amenities needed by the business and leisure traveler. The hotel provides a warm and welcoming service of international standard. For your reservation at the Radisson Hotel simply submit your dates and complete our secure online booking form.